She thought she knew everything about her family. Donna’s mother had married young and gave birth to a son. The marriage didn’t last, but her mother remarried, and nine years after her first son, Donna was born. She went through her whole life thinking she knew her mother’s story, but Donna G’s FamilyTreeDNA story really began when she received an email. One day, on her FamilyTreeDNA account, she found a message from a man claiming to be her brother. That didn’t make any sense to Donna, she couldn’t have a brother she didn’t know about. Her mother had only been married twice. What was going on? 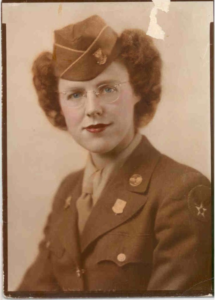 Donna’s mother, Women’s Army Corps. The man had a story that would change Donna’s life, and explain things that she had never understood. He had been adopted, but after all his research and testing, he found his father, a famous WWII pilot. Now, he was searching for his mother. Donna knew her mother had served in the Women’s Army Corps, but that was before she had been born, and she didn’t know much about it. After being tested and confirming the man was her brother, they pieced together the story. Her mother had fallen in love with a pilot during the war and she became pregnant. However, he was married, and Donna’s older brother was already being cared for by his grandparents. In the end, Donna’s mother was forced to give the baby up for adoption. After Donna’s mother and the pilot went their separate ways, several years later she married Donna’s father. Prior to her mother’s death in 2002, she had insisted that Tennyson’s poem, “Crossing the Bar,” be read at her funeral, but Donna was never sure why. Looking back, she remembered that the final line of the poem stated, “I hope to see my Pilot face to face/When I have crost the bar.” She realized what this must have meant. Donna’s mother always loved that pilot, and she was hoping they would now be reunited. By the time Donna’s brother reached out, most of Donna’s family was already gone. But luckily now, her family was growing again. 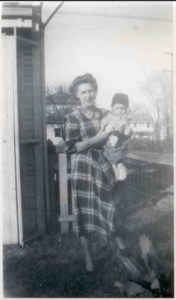 For more posts like Donna G’s FamilyTreeDNA story, read about Patricia’s FamilyTreeDNA story. That story will bring a tear to your eye.